Not to be confused with Rutland (town), Vermont. 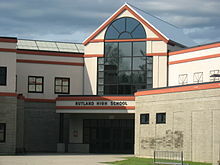 The city of Rutland is the seat of Rutland County, Vermont, United States. As of the 2010 census, the city had a total population of 16,495. It is located approximately 65 miles (105 km) north of the Massachusetts state line and 20 miles (32 km) east of the New York state line. 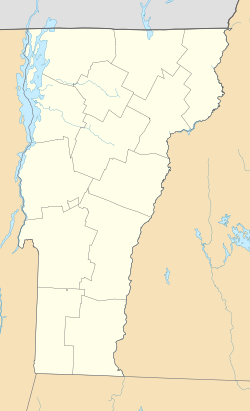 Rutland is the third largest city in the state of Vermont after Burlington and South Burlington. It is surrounded by the town of Rutland, which is a separate municipality. The downtown area of the city is listed as a historic district on the National Register of Historic Places. It began on Otter Creek in the early 19th century as a small hamlet called Mill Village in Rutland, the surrounding town named by Governor Benning Wentworth in 1761 after John Manners, 3rd Duke of Rutland. In the early 19th century, small high-quality marble deposits were discovered in Rutland, and in the 1830s a large deposit of nearly solid marble was found in what is now West Rutland. By the 1840s, small firms had begun excavations, but marble quarries proved profitable only after the railroad arrived in 1851. At the same time, the famous quarries of Carrara in Tuscany, Italy, grew largely unworkable because of their extreme depth, allowing Rutland to become one of the world's leading marble producers. A large number of Italians with experience in the industry immigrated and brought their families to Rutland. In 1903, a Rutland City ordinance restricting the carrying of firearms led to the Vermont Supreme Court's decision in State v. Rosenthal, thereby establishing protection for the carrying of firearms without permit or license, what has become known as "Vermont Carry". Nonetheless, Rutland had a similar ordinance in place as late as 1998, at which point it was challenged and eventually removed. The closing of the marble quarries in the area in the 1980s and 1990s led to a loss of jobs in the area. Rutland is located at 43°36′32″N 72°58′47″W﻿ / ﻿43.60889°N 72.97972°W﻿ / 43.60889; -72.97972 (43.60889, −72.97972). The city of Rutland has a humid continental climate (Köppen Dfb) with long, cold, and snowy winters and warm, moist summers. The all-time record high is 102 °F or 38.9 °C, set in 2008. The all-time record low temperature is −43 °F or −41.7 °C, set in 1994. On average, the wettest month is July, and February is the driest. Rutland is the 3rd largest city in Vermont that is not located on, or near, either of the state's two major Interstate highways. It is, however, signed on I-91 at exit 6 northbound in Rockingham and appears on auxiliary signs at exit 10 southbound near White River Junction. The city is also signed on I-89 at exit 13 southbound in South Burlington, exit 3 southbound in Royalton, and exit 1 northbound in Quechee. In addition, the city appears on auxiliary guide signs on the Adirondack Northway (I-87) before Exits 17 and 20. U.S. Route 4 and U.S. Route 7 intersect and overlap each other in Rutland along Main Street between the Diamond Run Mall and Woodstock Avenue and are the two main routes into the city. U.S. 7 connects Rutland with Manchester and Bennington to the south, and with Middlebury and Burlington to the north. To the east, U.S. 4 travels through Killington, Woodstock and White River Junction on its way toward New Hampshire. To the west, U.S. 4 has been rebuilt as a 4-lane freeway to the New York state line, a distance of just over 18 miles (29 km). It is currently the only limited-access freeway to serve Rutland. The former route of U.S. 4, which runs parallel to the freeway portion, is now signed as U.S. Route 4 Business and Vermont Route 4A. Rutland's railroad station is the terminal station for Amtrak's Ethan Allen Express, which provides daily 5.5 hour service to and from New York City. The state and Amtrak have undertaken an extension of the Ethan Allen Express from Rutland to Burlington, Vermont, the state's largest city. Track improvements and tunnel construction have begun. The project creates a regional rail corridor connecting Albany, Saratoga Springs, Rutland and Burlington and their combined metro populations of around 1.25 million inhabitants. And this would provide the first direct passenger rail connection from downtown Burlington to New York City since 1953 the Rutland Railroad ended service, and would begin in 2018. Rutland is home to "The Bus", run by Marble Valley Regional Transit District, a local bus system costing $0.50 per person per ride ($0.25 for discount qualified riders), and $1–2 for out-of-town commuter and connector buses, with other expenses covered largely by taxpayers. Five local routes currently serve the city, along with other commuter routes serving the nearby towns of Fair Haven, Manchester, Middlebury (in a partnership with Addison County Transit Resources), and Proctor. 2 winter tourist geared buses also go to and from Okemo Mountain in Ludlow and Killington Ski Resort; the bus serving Killington is called the Diamond Express. Both of these buses run year round. "The Bus" was free prior to 2007, when the 50 cents fare was added to control the added gas expenses. MVRTD is housed in the downtown Marble Valley Regional Transit Center. Premier Coach's Vermont Translines serves Rutland daily with two intercity bus connections between Burlington, Lebanon, New Hampshire and Albany, New York, in its partnership with Greyhound. The two bus lines also meet at the Marble Valley Regional Transit Center as of June 9, 2014. The Rutland Southern Vermont Regional Airport is located just south of the city, in North Clarendon. The airport offers daily flights only to and from Boston, Massachusetts which are operated by Cape Air. As of the census of 2010, there were 16,495 people, 7,167 households, and 4,209 families residing in the city. The population density was 2254.5 people per square mile (870.3/km2). There were 7,167 housing units at an average density of 94.49/sq mi (289.0/km2). The racial makeup of the city was 95.9% White, 0.8% African American, 0.3% Native American, 0.8% Asian, 0.1% Pacific Islander, 0.3% from other races, and 1.8% from two or more races. Hispanic or Latino of any race were 1.5% of the population. In the city, the population was spread out with 22.7% under the age of 18, 7.8% from 18 to 24, 28.9% from 25 to 44, 22.4% from 45 to 64, and 18.2% who were 65 years of age or older. The median age was 39.3 years. For every 100 females, there were 89.8 males. For every 100 females age 18 and over, there were 86.5 males. At the local level, Rutland is governed by a Mayor and Board of Aldermen. For representation in the Vermont House of Representatives, Rutland is split into four districts. In the Vermont Senate, Rutland is represented by three state senators who serve most of Rutland County. Major area employers are Rutland Regional Medical Center, General Electric Aircraft Engines (GE), OMYA, Green Mountain Power and Carris Reels. GE employed 975 workers in 2010. Casella Waste Systems is the second largest private employer (behind GE Aircraft), employing 583 employees at its headquarters on Green Hill Lane. Five businesses have opened in downtown Rutland since September 2013, including Small Dog Electronics (since closed), The Bakery, Cape Air, Raw Honey Apparel Yogurt City, and Hop'n Moose Brewing, a brewpub that will be brewing hand-crafted beer. A corner in Downtown Rutland was also described in a 2014 article describing the city's embedded heroin trade. The downtown section contains the Rutland Free Library, the Paramount Theater and Merchant's Row, a restored street dating back to the mid-19th century. 108 buildings in downtown Rutland are listed in the National Register of Historic Places. Rutland also has the 275-acre (111 ha) Pine Hill Park offering mountain biking, hiking, and other outdoor recreation. At the park's entrance is the Flip Side Skatepark, municipally operated in an open-sided closed roof arena at the Giorgetti Athletic Complex. Multiple episodes of the truTV reality show, Speeders, feature the Rutland City Police Department. Since 1986, Rutland hosts an annual exchange called the Rutland Ishidoriya Student Exchange (R.I.S.E), selecting students from grades 8-11 to send to Ishidoriya, Japan. All of the money used to support the exchange is from fundraising. In exchange, five students from Ishidoriya come to Rutland the January after the Rutland ambassadors return each year. A publicly funded pre-kindergarten program for eligible families is offered through Rutland County Head Start on Meadow Street. Private schools include the Catholic Christ the King School (primary) and Mount Saint Joseph Academy (9-12), and the Rutland Area Christian School (K-12). Private pre-kindergarten programs are offered at Grace Preschool, Hearts and Minds Childcare and Preschool, Good Shepherd's Little Lambs Early Learning Center, The Peanut Gallery Preschool & Early Learning Center, and more. The city is also home to two colleges, the College of St. Joseph in Vermont (formerly called College of Saint Joseph the Provider), and Community College of Vermont (CCV). Many Rutland residents will commute to nearby Castleton University, whose hockey teams practice in nearby Rutland Town. The city's print news comes from the Pulitzer Prize-winning Rutland Herald, which publishes five days a week. The weekly newspapers "Green Mountain Outlook" and the "Rutland Reader" are also published in Rutland. "The Mountain Times" is also widely circulated in Rutland. Rutland is part of the Burlington / Plattsburgh television market. Comcast offers most major in-market channels, including local Vermont PBS outlet WVER, channel 28, as well as Albany, New York stations WRGB (CBS), WTEN (ABC), and WMHT (PBS). PEGTV broadcasts local government programming on Comcast channels 15, 20, and 21. ^ Flagg, Kathryn (February 1, 2012). "Leaving RutVegas". Seven Days. ^ "Race, Hispanic or Latino, Age, and Housing Occupancy: 2010 Census Redistricting Data (Public Law 94-171) Summary File (QT-PL), Rutland city, Vermont". U.S. Census Bureau, American FactFinder 2. Retrieved November 1, 2011. ^ "State V. Rosenthal". Guncite.com. May 30, 1903. Retrieved January 5, 2016. ^ "Vermonters for Liberty :: Vermont Libertarians". Vtlp.org. Retrieved January 5, 2016. ^ "Climate Statistics for Rutland, Vermont". Retrieved January 4, 2014. ^ "Ethan Allen Express - the Train from Albany to NYC and Rutland". Amtrak. August 27, 2015. Retrieved January 5, 2016. ^ "Vermont governor seeks more Amtrak service". Railway Age. January 31, 2013. Retrieved January 5, 2016. ^ Christine Souders. "New Vermont Bus Service Coming Soon - Story". MyChamplainValley.com. Archived from the original on October 6, 2014. Retrieved January 5, 2016. ^ "Vermont Bus Schedules". Vttranslines.com. Retrieved January 5, 2016. ^ "Annual Estimates of the Resident Population for Incorporated Places: April 1, 2010 to July 1, 2017". Archived from the original on May 23, 2015. Retrieved June 4, 2015. ^ "American FactFinder". United States Census Bureau. Retrieved June 12, 2016. ^ "City of Rutland, Vermont". Rutlandcity.org. March 3, 2015. Retrieved January 5, 2016. ^ "The Vermont Legislative Bill Tracking System". Leg.state.vt.us. Retrieved January 5, 2016. ^ "District: RUT" (PDF). Leg.state.vt.us. Retrieved January 5, 2016. ^ Briggs, John (August 23, 2010). "Sky's the limit". Burlington, Vermont: Burlington Free Press. pp. 1B, 12B. ^ "REDC Major Employers". Rutland Economic Development Corporation. Archived from the original on July 25, 2011. Retrieved April 17, 2011. ^ "Rutland Regional Medical Center". Vermont.com. Retrieved January 5, 2016. ^ "Small Dog closes Rutland store | Rutland Herald". Rutland Herald. April 13, 2017. Retrieved July 27, 2018. ^ Palmer, Hannah. "A Locavore Bakery Opens in Rutland | Food News | Seven Days | Vermont's Independent Voice". Sevendaysvt.com. Retrieved January 5, 2016. ^ "Cape Air opens office in downtown Rutland | Vermont Business Magazine". Vermontbiz.com. January 6, 2014. Retrieved January 5, 2016. ^ "New Rutland businesses emerge downtown : Rutland Herald Online". Rutlandherald.com. October 27, 2013. Retrieved January 5, 2016. ^ "FroYo a go-go: Yogurt City opens in Rutland". Rutland Reader. November 13, 2013. Retrieved January 5, 2016. ^ "Rutland's first brewpub plans April opening". Timesargus.com. January 14, 2014. Retrieved January 5, 2016. ^ "A Call to Arms on a Vermont Heroin Epidemic". The New York Times. Retrieved January 5, 2016. ^ "Rutland Free Library". Rutlandfree.org. September 30, 1999. Retrieved January 5, 2016. ^ Vermont. "Paramount Theatre | Rutland, Vermont". Paramountvt.org. Retrieved January 5, 2016. ^ "Pine Hill Park" (PDF). Pinehillpark.org. Retrieved January 5, 2016. ^ "Flip Side Skatepark in Rutland, VT 2015 Season". 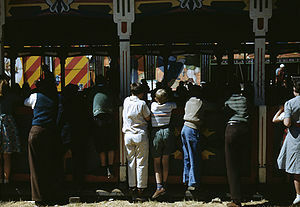 FlipSidePark.com. April 26, 2009. Retrieved January 5, 2016. ^ "Rutland scares up pride with 50-year Halloween Parade : Rutland Herald Online". Rutlandherald.com. Retrieved January 5, 2016. ^ "About Rutland County Head Start". Rchsccn.org. Retrieved January 5, 2016. ^ "Grace Preschool | Rutland, VT Preschool". Gracepreschoolvt.com. February 9, 2015. Retrieved January 5, 2016. ^ "Rutland Herald". Rutland Herald. Retrieved January 5, 2016. ^ "About Us | Rutland Herald". Rutland Herald. October 21, 2016. Retrieved July 27, 2018. ^ Minichiello, Patricia. "Rutland Reader". Rutland Reader. Retrieved January 5, 2016. ^ "TV Listings, TV Show Guide, Entertainment News, TV Ratings". Zap2It. Retrieved January 5, 2016. ^ "Rutland Region Community Television 15, 20, 21". PEGTV. Retrieved January 5, 2016. Federal Writers’ Project (1937). "Rutland". Vermont: a Guide to the Green Mountain State. American Guide Series. Cambridge, Massachusetts: Riverside Press – via Internet Archive. Wikisource has the text of a 1920 Encyclopedia Americana article about Rutland, Vermont.